This Latino tradition makes people walk barefoot. Those who believe in Our Lady of Guadalupe say that praying to her and offering “mandas,” has proved miraculous. A “manda,” a promise to do some type of sacrifice in exchange for a miracle, gets the job done, they say. Our Lady of Guadalupe has healed a loved one’s illness, protected children from danger and brought solace to people challenged by misfortune, legend has it, and many Mexicans attest. One of the most common “manda” is to walk barefoot during “La Peregrinacion,” a march every December 12 or within a few days before, usually early in the morning, starting from a church, passing through town, and ending with a mass in another church –and it may take many hours and miles. December 12 is the day to celebrate La Virgen. The centuries-old tradition, has turned from religiosity into popular culture. Mexicans and other Hispanics in their country of origin and across the United States adore the sacred saint and image, even though many understand it was a figure designed to convert the Mexican natives or Indians to Catholicism during the Spanish conquest. Our Lady of Guadalupe is popular in Guatemala and El Salvador too. People walk for one reason or another. 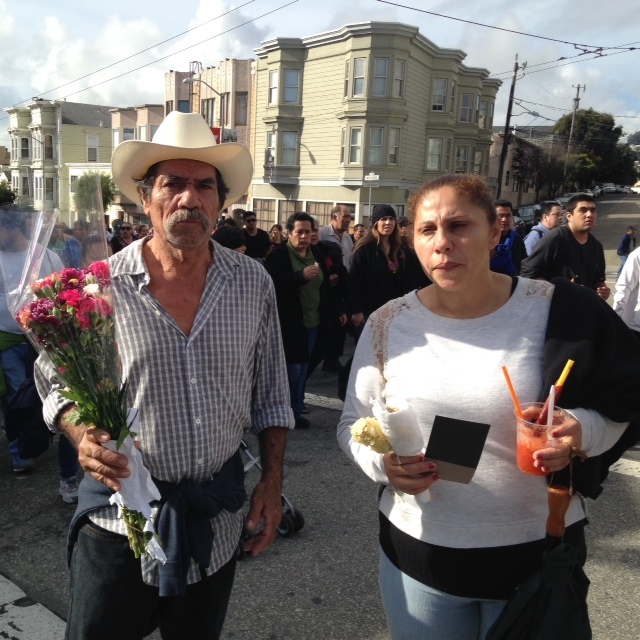 The man in the picture, holding a bouquet of roses, for instance, is paying respect to the saint, and praying for her sister, who passed away a few days before the march. 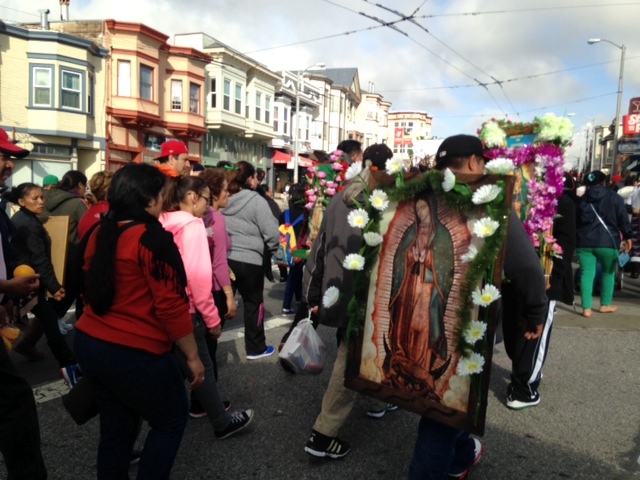 In San Francisco, the 12 mile pilgrimage has happened every December for the last 30 years, organized by Pedro Garcia and several others. It is a beautiful, meaningful walk, filled with people carrying flowers, dressed up in typical indigenous ways, and full of reverence. One of the walkers in 2014 is Karina Lara, a college student. Her “manda,” is for the “Dreamers,” the undocumented students protected under the Dream Act. Interviewed in Spanish, she says that she believes in “La Virgen,” and trusts that a miracle will happen, permanently legalizing certain youth. She has walked the procession barefoot for the last 4 years. Lupita Peimbert publishes Lupitanews. She is a bilingual blogger, and writer. A former Spanish-TV news reporter, she was born in Mexico, and remembers walking in many pilgrimages for our Lady of Guadalupe since she was 2 years old. Previous 3 Must See Italian Films! Next This Latino tradition makes people walk barefoot. 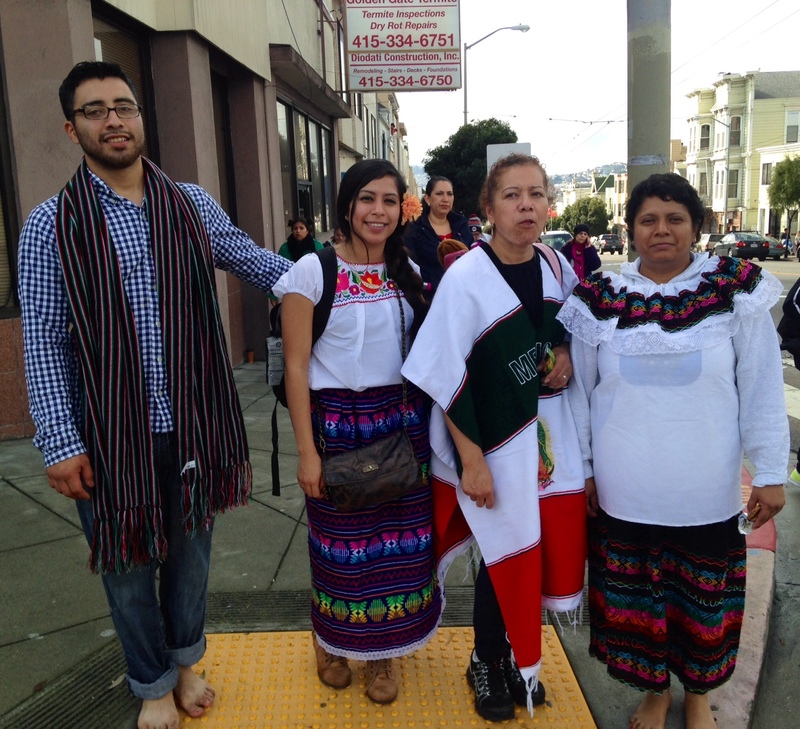 Pingback: This Latino tradition makes people walk barefoot. | Lupitanews: Stories Must Be Told.